Explanation: Against dark rifts of interstellar dust, the ebb and flow of starlight along the Milky Way looks like waves breaking on a cosmic shore in this night skyscape. 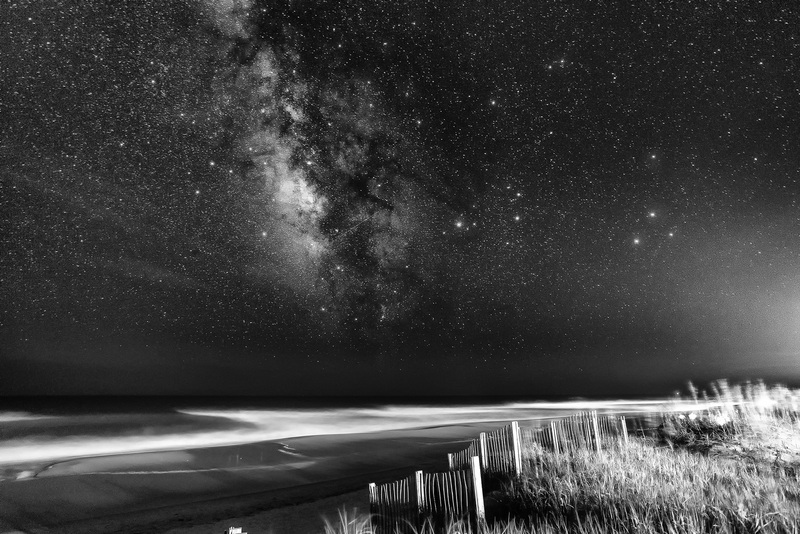 Taken with a digital camera from the dunes of Hatteras Island, North Carolina, planet Earth, the monochrome image is reminiscent of the time when sensitive black and white film was a popular choice for dimmly lit night- and astro-photography. Looking south, the bright stars of Sagittarius and Scorpius are near the centre of the frame. Wandering Mars, Saturn, and Zubenelgenubi (Alpha Librae) form the compact triangle of bright celestial beacons farther right of the galaxy's central bulge. Of course, the evocative black and white beach scene could also be from that vintage 1950s scifi movie you never saw, "It Came From Beyond the Dunes."